What if Bush Bombs us ALL back to the stone age? Then this book becomes a survival book! 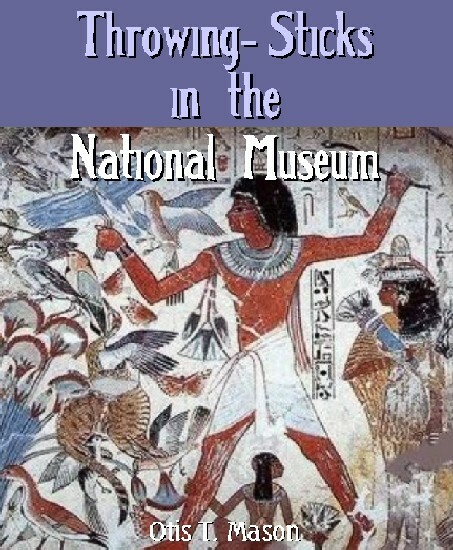 Man used sticks to conquer his world before the advent of metal tools and weapons. 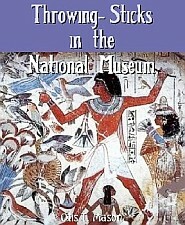 Col. Lane Fox tells us there are three areas of the throwing-stick: Australia, where it is simply an elongated spindle with a hook at the end; the country of the Conibos and the Purus, on the Upper Amazon, where the implement resembles that of the Australians, and the hyperborean regions of North America. It is of this last group that we shall now speak, since the National Museum possesses only two specimens from the first-named area and none whatever from the second. The researches and collections of Bessels, Turner, Boas, Hall, Mintzner, Kennicott, Ray, Murdoch, Nelson, Herendeen, and Dall, to all of whom I acknowledge my obligations, enable me to compare widely separated regions of the hyperborean area, and to distinguish these regions by the details in the structure of the throwing-stick. The method of holding the throwing-stick is indicated in Fig. 1 by a drawing of H.W. Elliott. The Eskimo is just in the act of launching the light seal harpoon. The barbed point will fasten itself into the animal, detach itself from the ivory foreshaft, and unwind the rawhide or sinew line, which is securely tied to both ends of the light wooden shaft by a martingale device. The heavy ivory foreshaft will cause the shaft to assume an upright position in the water, and the whole will act as a drag to impede the progress of the game. The same idea of impeding progress and of retrieving is carried out by a multitude of devices not necessary to mention here. The Eskimo spend much time in their skin kyaks, from which it would be difficult to launch an arrow from a bow, or a harpoon from the unsteady, cold, and greasy hand. This device of the throwing-stick, therefore, is the substitute for the bow or the sling, to be used in the kyak, by a people who cannot procure the proper materials for a heavier lance-shaft, or at least whose environment is prejudicial to the use of such a weapon. Just as soon as we pass Mount St. Elias going southward, the throwing-stick, plus the spear or dart of the Eskimo and the Aleut, gives place to the harpoon with a long, heavy, cedar shaft, weighing 15 or 20 pounds, whose momentum from both hands of the Indian, without the throw-stick, exceeds that of the Eskimo and Aleut darts and harpoons, with the additional velocity imparted by the throwing-stick. It must not be forgotten, also, that the kyak is a very frail, unsteady thing, and therefore not much of the momentum of the body can be utilized, as it is by the Northwest Indians in making a lunge with a heavy shaft. The throwing-stick is also said by some arctic voyagers to be useful in giving directness of aim. Perhaps no other savage device comes so near in this respect to a gun barrel or the groove of a bow-gun. Its greatest advantages, however, are the firm grip which it gives in handling a harpoon or dart, and the longer time which it permits the hunter to apply the force of his arm to the propulsion of his weapon. 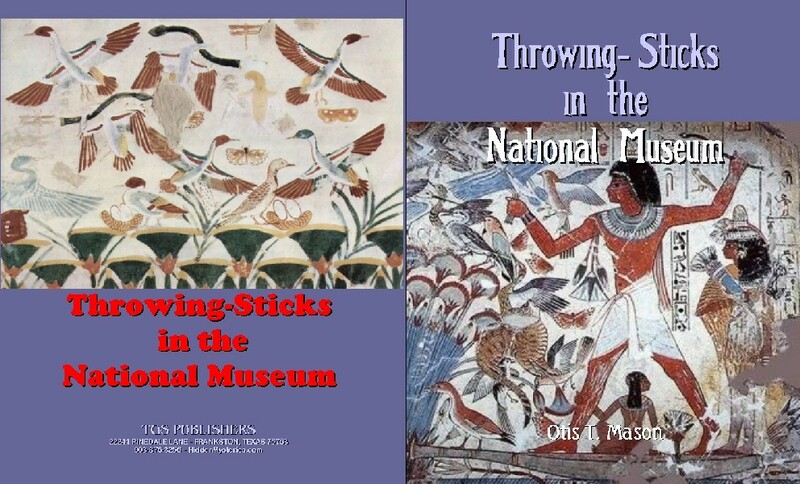 Having practiced with a throwing-stick somewhat, I have imagined also that there was a certain amount of leverage acquired by the particular method of holding the stick and straightening the arm, as in a toggle joint. That implement, which seems so simple, and which is usually mentioned and dismissed in a word, possesses several marks or organs, which help to distinguish the locality in which each form occurs, as well as to define the associations of the implement as regards the weapon thrown from it and the game pursued.